Floral City is a charming Nature Coast town that celebrates its history while welcoming visitors in the present. Recently, I was taken on an historical walking tour by Shannon Burns, local historian and daughter of “Aunt Martha,” of Aunt Martha’s Produce Stand. It was informal, interesting and well researched. Shannon also hosts “Floral City: the Real Old Florida” on WKYE TV. You can watch episodes here. Florida’s Nature Coast is brimming with history. Local history tells us that the Timucuan Indians were in this area as early as 800 A.D., with their burial mounds found from New Port Richey to Crystal River. In fact, the Crystal River Archaeological State Park shows that Timucuans from other areas came to Citrus County to bury their dead. In 1539, Hernando DeSoto visited the Timucuan Indian village of Tocaste, located on the edge of Lake Tsala Apopka as part of his 6 day trip through eastern Citrus County. In the early 1800s, the Seminole Indians established a village near the current historic district of Floral City and named it Cho-illy-hadjo, which translates in to “Crazy Deer’s Foot.” Their artifacts were still being found on the grounds of the First Baptist Church of Floral City in the mid-1980s. In fact, there were Seminole Indian villages throughout our area. The village in Floral City was destroyed by American soldiers in 1837 during the second Seminole Indian war. The 1842 Armed Occupation Act ended Seminole resistance by encouraging armed white settlers to move into the area. The act granted a patent for 160 acres to any man who kept a gun and ammunition, built a house, cultivated 5 acres of land and lived there for a minimum of 5 years. This legislation is what brought most of Florida’s early settlers here. The Duval House, built in the 1860s is the oldest home in Citrus County and is currently being renovated. A street sign at the east end of Floral City points the way to Duval Island which was purchased in the mid-1800s by an ex-confederate soldier named John Paul Formy-Duval. About 1860, John Paul built a two-story home on the southeast corner of Orange Avenue and Old Floral City Road. He built another home on the island where he planted citrus groves, sugar cane and assorted produce. The two story “town” home is the oldest in Citrus County and it is currently being renovated to its former glory. As settler families moved into the area, many citrus groves were planted. Harvests were shipped to northern markets via steamboat. The Kitty Bell, Reindeer, Gray Eagle, and the Sam Pyle navigated Lake Consuela, the Orange State Canal (dug in 1884) and the Withlacoochee River, providing transportation for local growers. Then the Big Freeze of 1894-95 put a halt to the area’s citrus industry for twenty years. The Avenue of the Oaks in Floral City was created over 100 years ago. The centenarian oak-lined County Road 48, called Orange Avenue, is the most vivid reminder of Floral City becoming incorporated (if only for 4 years). 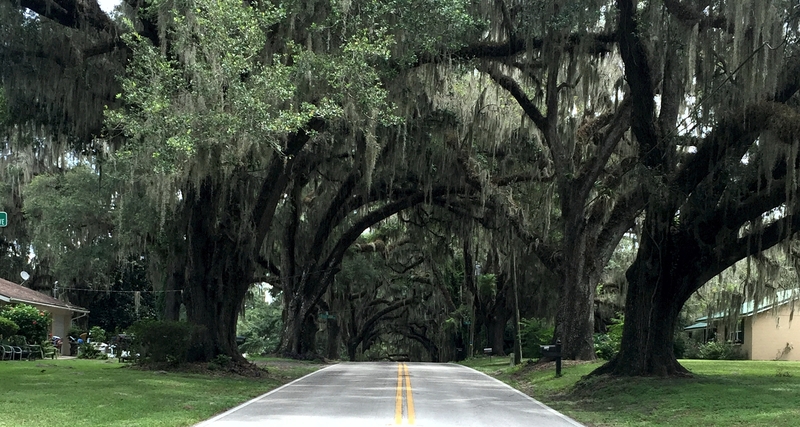 The exquisite “Avenue of the Oaks” was planted by the residents in 1884 after the village was surveyed and laid out by Senator Austin S. Mann and Surveyor W. H. Havron. Senator Mann convinced the Florida legislature to establish Citrus County on June 2, 1887. At that time, Floral City was to be the County seat. Inverness stole the distinction a few years later. To hear the full story, book a walking tour. In 1893, part of the Plant System Railroad was extended through Floral City and hard rock phosphate deposits were discovered. By the late 1890s, the phosphate boom had exploded, with over 10,000 workers coming in from as far away as South Carolina! At that time Miami’s population was 350. African-Americans during this period comprised 96% of the residents and many made important contributions to the town by establishing commercial ventures, social orders and religious structures. When the phosphate boom ended, most left town. 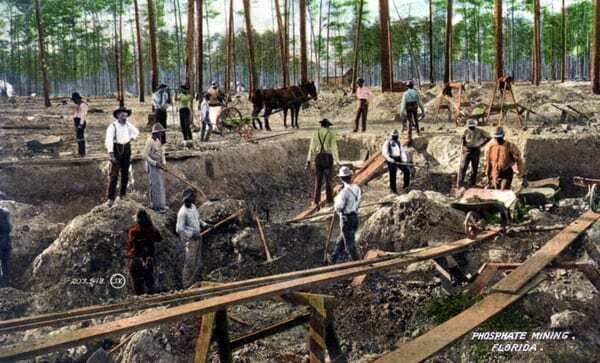 Phosphate began to be excavated with steam shovels instead of hand-picks and shovels. The population abruptly dropped to its current level of less than 3,000. Many mines were opened in the area, including Hines, Bradley, Mutual, Ten Cent, Hamburg and Butten. One of the many historic homes in Floral City, built by H.D. Bassett, Superintendent of the Black Diamond Phosphate Mine. Remnants of the phosphate boom period can be seen in the stately old homes built by the phosphate superintendents and the lime rock Floral City Community Building, built during the 1930s Great Depression recovery period. When the railroad came to town, the steam ships were no longer needed, and hard rock phosphate was carried from the area by train. When WWI began, the German embargoes strangled the local industry. South Florida’s pebble phosphate supplies took over after the war and local employment has been in short supply ever since. The railroad ceased operation in the mid-1980s and the old road bed is now The Withlacoochee State Trail. Floral City is the geographic center of the 46-mile trail, which winds throughout the Nature Coast. 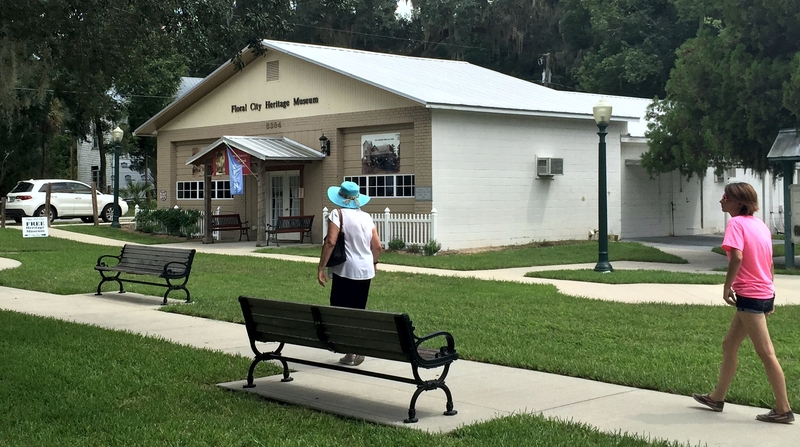 This paved recreational trail is popular for hiking, biking, and horse riding enthusiasts, winding through the small towns and rural countryside of eastern Citrus, Hernando and Pasco counties. The Tamiami Trail, now US-41, was constructed in the 1920’s, as automobile transportation became popular. Capitalizing on the real estate boom of the 1920’s, James C. Ferris planned an ambitious development on Duval Island, but it fell victim to the economic crash. In the 1920’s and 1930’s, several local citrus groves were reestablished, most notably Ferris Groves. This icon of Floral City was established in 1927 by L. G. Ferris, son of James C. Ferris. Today, Ferris Groves grows strawberries, as well as citrus and has had a roadside stop on their US 41 location. They serve samples of fresh squeezed orange juice on-site and sell their citrus, berries, pies, juice, preserves and more from the little store. You can also ship gift fruit from the store. 5 miles south of Floral City and it was the site of “The Great Train Wreck of 1956.” On October 18, 1956 two Atlantic Coast Line Railroad freight trains hit head on, killing four men and injuring three others. A signpost at the site of the crash on the Withlacoochee State Trail memorializes the event. A display in the museum helps you understand what happened. Today, Floral City is certainly worth a day-trip to discover. A thriving art gallery is located a half block west of the U.S. 41 – C.R. 48 intersection with classes and events galore. If you travel to the east on Orange Avenue, you will find the Withlacoochee Trailhead. The Heritage Museum is open Friday and Saturday from 10 am to 2 pm featuring a diorama of the historic district in the early 1900s, and there is an amazing shop located in the museum where you can purchase heirloom seeds, historic coin recreations, historic maps and many unique items. Walking tours are available by reservation for groups from 2 to 20. The Floral City Heritage Museum is located in the former Fire Department and has great displays and a unique store located inside. Past the museum you find the Avenue of the Oaks, which can be followed down to the lake or around to find Floral City Park which features a Frisbee golf course, paved walking/jogging trail, picnic shelters and racquetball/handball and tennis courts. Floral City is home to the only historic district in Citrus County listed on the National Register of Historic Places, and that district runs roughly along Orange Ave. from S. Old Floral City Rd to S. Annie Terr, and S Aroostook Way from Orange to Tsala Apopka Lake. It contains 17 historic properties. The first weekend in December features the Annual Floral City Heritage Days. 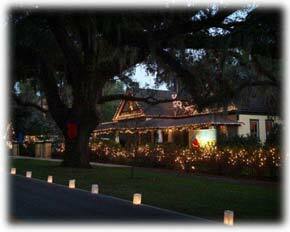 Friday evening kicks off Candles and Carols, with an AUCE fish fry and horse drawn wagon rides through Orange Avenue lined with luminaries under the centenarian Oaks. Carolers sing on the porches of historic homes. On Saturday, Dec 5, early Florida living history is featured with demonstrations, the annual Historic Home tour is available and there is a pig on a spit for bbq dinners, cornbread and more. More information can be found here. Spring brings the Floral City Strawberry Festival, featuring Ferris berries and lots of fun. Carnival rides, music, vendors and, of course, strawberry shortcake in a BIG way! The Floral City Strawberry Festival is slated for the first Saturday and Sunday in March each year. Ferris Farms also makes a great strawberry milkshake that can be had any time during the strawberry season. And always stop by Aunt Martha’s Produce on US 41, just north of the Orange Avenue intersection on the east side of the road. Their fresh produce is hand-picked and always comes with a smile. They also ship gift fruit. Traveler information included and you can book your own walking tour. For years I have driven up US 41 and said, “I should stop here.” I am glad to tell you that it was worth finding Floral City. I’ll be back and you should visit too.